All aboard the Fundy Rose, ship food, tallest wooden church in North America. Just over an hour later, we were lined up to roll on board the 124 meter (400ft) Fundy Rose. She can carry 774 passengers, has free WiFi, two movie lounges and free panoramic views of the Bay of Fundy. We naturally started in the cafe to have some lunch (lobster rolls, poutine and Moosehead beer) and then settled in the lounge area where a girl was playing celtic tunes on a fiddle to raise funds for a trip to Ireland, perfect mood music. Two hours later the rocky shore of Nova Scotia crept into view, and soon we were entering the Annapolis Basin and pulling up to the Digby Ferry Terminal. Yarmouth was still about 100 kilometers to the southwest, so we drove the scenic Evangeline Trail that hugs the coast instead of the main highway. Along the way stands the Église Sainte Marie, the tallest wooden church in North America, which is the most notable landmark on the way. 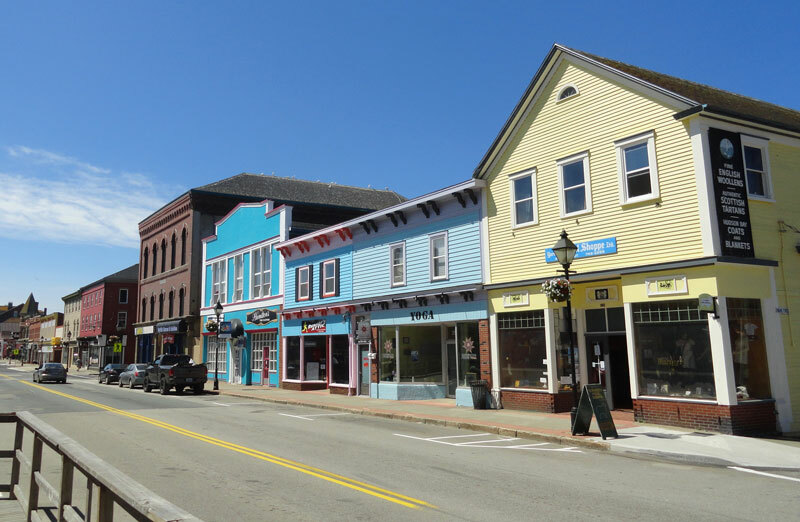 Yarmouth itself has a charming Main Street and picturesque harbor. Our lodging was just north of the center of town at the Lakelawn Motel and B&B. This extremely well-kept establishment contains bed and breakfast rooms in the historic main house, plus motel rooms in the side wings. A nice continental breakfast was included the next morning. That evening we went downtown to Rudders Seafood Restaurant and Brewpub for dinner on the waterfront. There was a live band, good house-brewed beers and a wide menu featuring some traditional Nova Scotian fare. One of Yarmouth’s most popular destinations is the Cape Forchu Lightstation Museum, the site of a lighthouse since 1840. The busy harbor and frequency of shipwrecks created the necessity for a string of lighthouses along the southwestern Nova Scotia coast. The current light dates from 1962 and is a distinctive, concrete “applecore” style lighthouse. The old keeper’s dwelling displays area historical information and artifacts. Working on the ocean is still a major way of life here, and can be best witnessed by watching the boats head out into the ocean for the opening of lobster season on “Dumping Day,” held in late November each year. Forty percent of Canada’s lobster catch comes from the rich waters in this region. At the very tip of the cape just beyond the lighthouse lies Leif Erikson Park where a short, half kilometer walking trail winds through rugged rocks that frame postcard views of the water and lighthouse. The park is named after Erikson because a runic stone found in the area is speculated to have been carved by Norse visitors hundreds of years ago. Whether or not the Norsemen visited this lovely spot, it was just the first of many spectacular viewpoints in Nova Scotia. Passing back through Yarmouth, we stopped at the trendy Sip Cafe for beverages and to pick up a sandwich we planned to eat at our next stopping point an hour down the road. Our trips frequently feature a lot of local beer, which can be seen in this post. One that caught our eye early in planning was Boxing Rock Brewing right along our route in Shelburne. It turned out to be one of our favorite breweries of the whole trip. Housed in a quaint wood-sided building surrounded by trees, they produce some truly delicious and unique brews. We each selected a flight of five and enjoyed them at a picnic table under the sun with the sandwiches we bought in Yarmouth. Afterwards we returned to the bartenders to buy big to-go bottles to drink that evening at our campsite in the first Canadian national park of our trip. Kejimkujik National Park (known usually as Keji for pronunciation purposes) contains two sections, the main portion in the remote interior of Nova Scotia and the smaller Seaside Adjunct section about 90 minutes to the south. We approached the seaside section first, so planned to make a quick visit. This section protects beaches, bogs, and lagoons, along with an abundance of coastal wildlife. There isn’t a visitor center at this outpost, but there are some nice trails that lead a few kilometers to the shoreline. Nearing the end of the Harbour Rocks Trail, a stunning view of tranquil, turquoise water and sandy beaches spread out before us. Just off shore, seals relaxed on rocks jutting out of the water. We were glad we didn’t skip this section of the park. View of the Atlantic from the end of the Harbour Rocks Trail at Kejimkujik Seaside. Continuing on, we made a left onto Highway 8 at Liverpool and headed into the center of Nova Scotia. It’s here that it becomes apparent that most settlements in the province are located on the coast while the interior is largely wild. The main portion of Keji is a 381 square kilometer area of thick forests and numerous linked waterways. It is probably best known as a site for fantastic canoeing and backcountry camping opportunities. Its charms were immortalized in the 1908 book The Tent Dwellers, by Albert Bigelow Paine, in which he documents a two week trout fishing excursion into the wild. It’s a good read for anyone planning to visit, as its colorful descriptions of the landscape are still accurate more than 100 years later. We were intent on experiencing Keji in an authentic way, so we reserved a backcountry campsite back in January of 2017 when the reservation books opened. There are some really cool canoe-only access sites located on islands in Kejimkujik Lake, but they were booked immediately, so we selected a site in the northeastern section of the park. Ours was Campsite #1, just a kilometer walk from the Big Dam parking area. It was easy to get to but still nearly a kilometer from the nearest other campers, giving it the secluded feel we were looking for. There are 46 backcountry sites to choose from along more than 100 kilometers of trails, so it’s possible to hike deep into the woods and not see another human for days if that’s what gets you going. 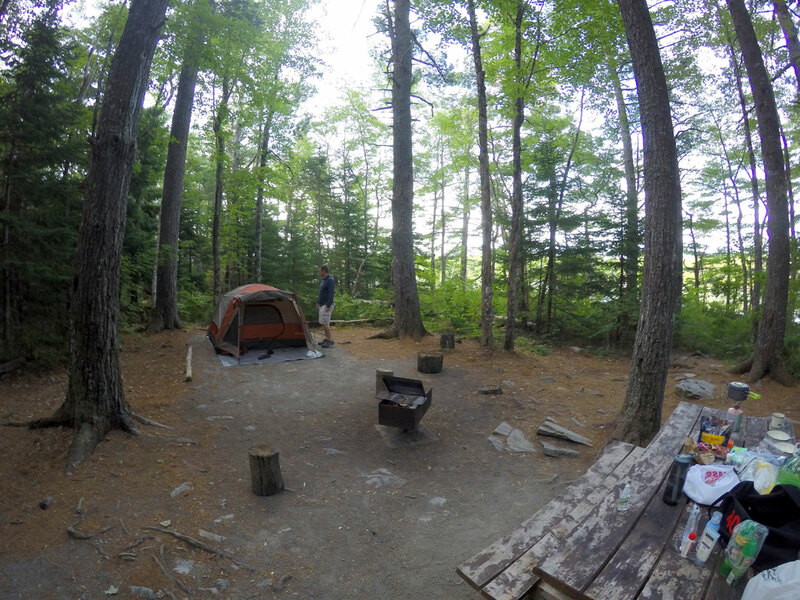 We found all Parks Canada campsites to be very well maintained. Each Keji site is equipped with a couple possible tent spots, a fire box, cut firewood supply, private pit toilet and a pulley system for hoisting supplies into the trees for bear avoidance purposes. Site 1 sits right along Big Dam Lake, so we had some waterfront property for lounging with our Boxing Rock beers after setting up the tent. Keji’s status as an International Dark Sky Park meant that as the sun dipped below the horizon, millions of stars appeared above. The light show was doubled by their reflection in the completely still water, a truly stunning sight. Starlight replacing sunlight from our campsite on the shore of Big Dam Lake. With the loss of the last bit of sunlight, we retreated to the glow of our fire. The utter silence became apparent and we started to notice every slight rustle of leaves around us, convinced that it was an animal paying a visit. At one point Nick caused brief panic by saying “What the HELL was that?! Something just walked by! !” I responded by shining my phone flashlight in the general direction and aggressively throwing a wood chip into the trees. It was probably a tiny squirrel moving on the ground … clearly we were not yet at one with nature. Throughout the night, various crazy noises kept us from achieving deep sleep. Loons are the major culprit here, as their vocal stylings can result in sounds not at all associated with birds. One was wailing an intermittent lonely wolfish cry throughout the night. Then at 3:30 am, two loons decided to have a loud conversation across the lake that sounded like monkeys screeching at each other. Our assessment is that loons are basically idiots. When daylight finally returned we decided that while true backcountry camping is fun, we do generally like being somewhat near other campers. There’s a fine balance between being crowded next to families in a big campground and feeling completely alone in the dark. On a multi-day outing I think we could get accustomed to the wilderness. In the meantime, we had future campgrounds to test our theory. Morning mist on Big Dam Lake. We retrieved our gear from its perch in the trees and prepared to start the day. One of the great pleasures of camping is camp stove coffee, which we enjoyed with our freeze dried “just add boiling water” biscuits and gravy from Mountain House. It’s shocking how good these meals taste, we highly recommend them for their ease of use and packable nature. With a lovely fog just skimming the surface of the lake, we packed up our site and trekked 20 minutes back to the parking area. 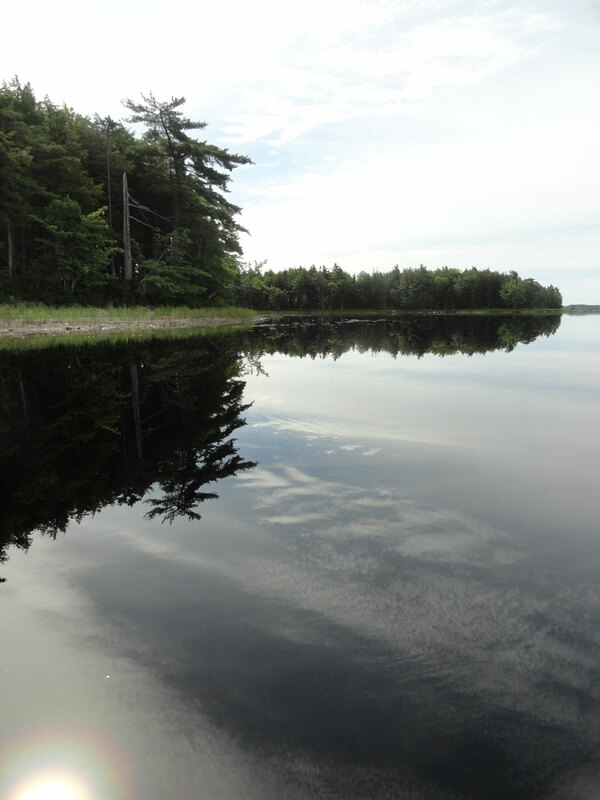 Our next must-do in Keji was canoeing on Kejimkujik Lake, the largest body of water within park boundaries. Canoe and kayak rentals are available from Whynot Adventure at Jake’s Landing by the hour or day. We grabbed a double canoe and spent two hours paddling the waters around a cluster of islands a couple kilometers off shore. The waters are so dark it’s almost like canoeing on black ink. The stillness from the night before continued into the day so that the sky and trees were reflected in the water in a near perfect mirror image. Back on land, we returned to Highway 8 and pointed toward the northern Nova Scotia Shore and a former colonial capital. 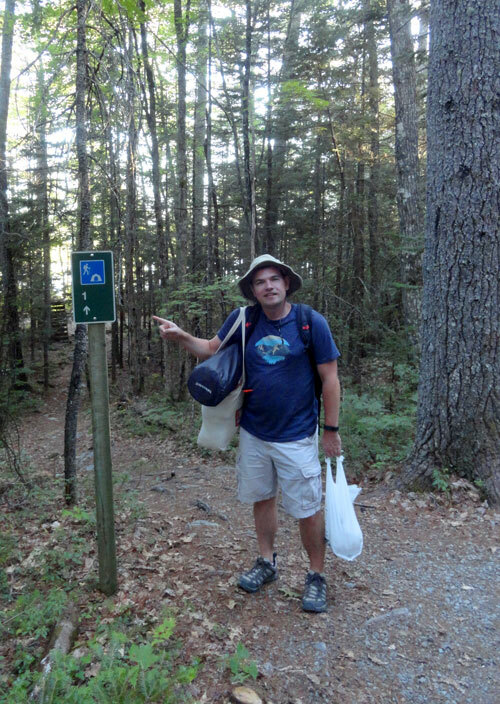 This entry was posted in Destinations, Travelogues and tagged Backcountry Camping, Boxing Rock Brewery, Cape Forchu Lightstation, Digby Ferry, Kejimkujik National Park, Kejimkujik Seaside, Nova Scotia, Nova Scotia Road Trip, Yarmouth. Bookmark the permalink.